Ontario PC Leader Doug Ford has proposed a $2.8-billion “middle class tax cut,” despite the fact the province is facing a deficit. Promoting tax cuts as “middle class tax cuts” is the latest fad in election-time politics. Prime Minister Justin Trudeau promised to cut middle class taxes in the 2015 election, but when we crunched the numbers, it turned out it was more of a tax cut for the rich than the middle class. So what of Ford’s promise of middle class tax cuts for Ontario? It is anything but. By 2020, when the tax cut would come into effect, changes to Ontario’s middle tax bracket would affect anyone with taxable income between $44,788 and $88,924. Currently, Ontarians in that income range pay 9.15 per cent in provincial income taxes. Doug Ford is promising to cut that down to 7.32 per cent, starting in year three of the next government’s mandate. We ran this proposal through Statistics Canada’s SPSD/M model to determine the distributional impact on anyone 18 or older. Short take: higher income earners stand to gain the most from this tax cut. Chart 1 shows the average individual benefit of the “middle class” tax cut by decile (2020). What this chart shows is that, under this proposal, the bottom 60 per cent of Ontario earners (those who earn less than $49,208) would receive, on average, just seven bucks in tax cuts. The next 30 per cent of income earners who make between $49,208 and $108,948 would get an average of $398 in tax cuts under this proposal. But the real winners are the richest 10 per cent of Ontario income earners: they would get an average of $1,168 in additional tax cuts. The policy change the PCs are advancing would not benefit anyone with taxable income of less than $44,788. It would provide a larger benefit to those with taxable income of $88,924 or more. This is because even if your income is above $88,924, you are receiving a tax cut on the income you make between $44,788 and $88,924 (above that income level, the additional income is taxed at a higher rate). However, it will provide the most benefit for high income Ontarians who pay surtaxes, with taxable incomes about $90,000 or more. This is because the additional surtaxes that they pay are based on their Ontario tax payable. The reduction on their Ontario tax payable reduces their surtaxes as well. 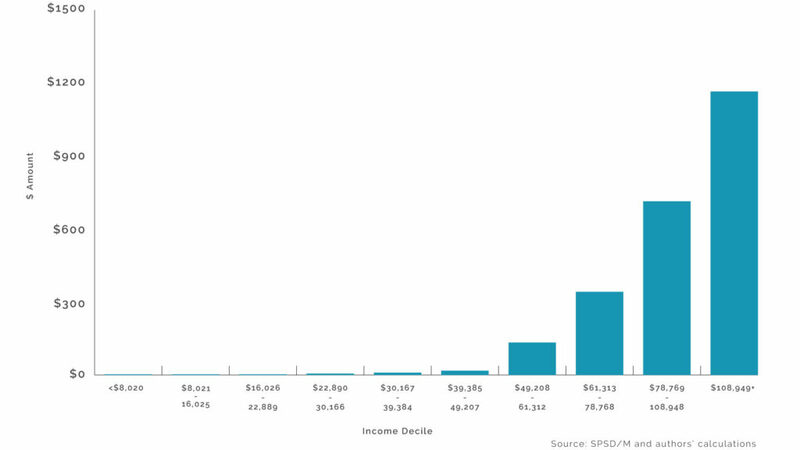 Chart 2 shows the percentage of the proposed 2.8-billion tax cut that will go to each income decile (2020). 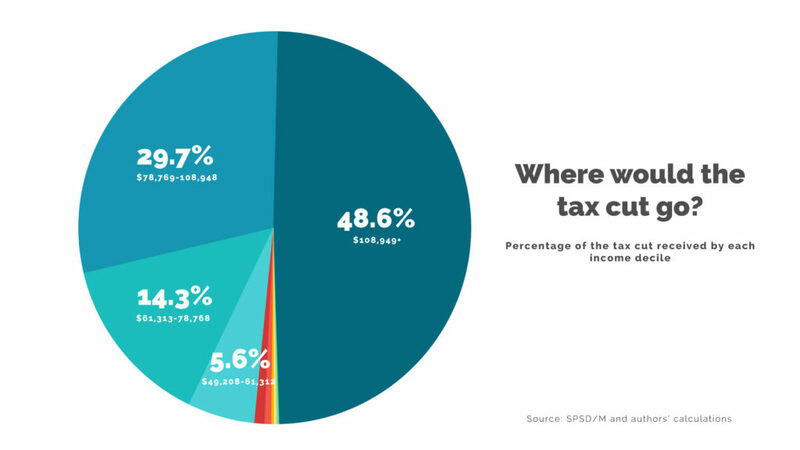 This chart shows just how polarizing this tax proposal would be: the bottom half of tax filers would get 1 per cent of this tax cut while the top 10 per cent of income earners would get 49 per cent of this tax cut. So, are middle class tax cuts a false hope? In this case, partly. The lion’s share of the gains would accrue to the richest 10 per cent. This analysis is based on Statistics Canada’s Social Policy Simulation Database Model 26.0. The assumptions and calculations underlying the simulation results were prepared by David Macdonald and the responsibility for the use and interpretation of these data is entirely that of the authors. The PC party backgrounder stated that the maximum benefit would be $786. They appear to be using the 2017 tax brackets without including the impact of surtaxes on higher income individuals. The maximum benefit including the surtax would be $1,227. The 2018 budget eliminated the surtaxes, but also changed the tax brackets. The second tax bracket in the 2018 system applies to taxable incomes between $42,960 and $71,500. The maximum savings would be $522 using the 2018 system, and you’d have to make $71,500 to get the full benefit. The maximum benefit wouldn’t be $786 under either tax system. In an attempt to be consistent, we used the 2017 tax system in our comparative analysis. We used the 2020 tax year since that’s the year the proposal would kick in, according to the PC party backgrounder. David Macdonald is a senior economist with the Canadian Centre for Policy Alternatives. Follow David on Twitter @DavidMacCdn. Sheila Block is a senior economist with the Canadian Centre for Policy Alternatives’ Ontario office. Follow Sheila on Twitter @Sheila_M_Block. Author’s note: We are monitoring major proposals from all of the parties in the lead up to the June 7 election, analyzing their implications for income inequality, decent work, public services, climate change, and ensuring a just transition that works for all. The PC party is the only party in this election offering personal income tax cuts. • Which tax, what middle class? Debunking the income splitting debate. Lower taxes are a major break for middle class tax payers. Beats other promises by far. Plus Ford’s positive attitude gives hope and promise of prosperity to folks trying to get ahead in life. Apologies for any confusion about our comment approval policy. All comments are held until a member of our team can review them. The delay is by no means a reflection on the content of your comment. Dureen, did you read the article? It’s not at all a major break for middle-class taxpayers unless your idea of the middle class is making over $100,000 a year. How a political party could have the gall to run in an election without a platform is beyond my democratic understanding. Both Liberal and Conservative contenders in Thunder Bay have refused to even attend a debate! Unbelievable. Also, tax cuts that benefit the upper middle class and uber rich is hardly, in any way or form, beneficial to society as a whole.